Unfortunately I couldn’t tour Korea with Rebecca today, it was back to the daily work week grind for me. However I was very fortunate to have the time I did off with her. Rebecca decided to get up, Skype, and catch the metro down to Myeongdong to see one of Korea’s catholic cathedrals. Afterwards she stopped off in Itaewon and found the foreigners bookstore called What The Book. She said the new books were priced a bit steep, but the used ones were very reasonable. After grabbing two new books and a mango smoothie, Rebecca decided to make her way back to our place in Dongducheon. I’m so glad that shes the type of gal to seize the opportunity and get out see things even if I can’t join. Once I got home from work we decided on dinner and a stroll along the metro line. 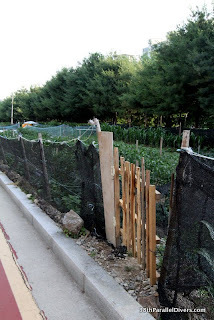 I wanted to show Rebecca how the Koreans utilize the land and space for all it’s worth. It’s incredible! I mean even the building that I work at, outside has a tiny patch of something green sprouting up. We really could learn a lot as Americans from this self sufficiency. As we walked, we reminisced about the fun times we had growing up. We talked about Rebecca’s friend Nora, which by the way she sounds so sweet, and how she is interested in starting up urban gardening programs. I made sure to snap some photos to share with her. We ended up eventually at Lotte Mart. We decided that we wanted stone bowl bibimbop. It really hit the spot too! Eventually, later in the evening, we met up with Mr. B and decided on going for dessert. Pot bing su! Is there anything else in the summer months of Korea? Our cool treat was absolutely heavenly! We all walked back to Mr. B’s car while taking in the city lights, occasionally stopping for some photos. We’re big cheesers, we simply cannot help it ! Im super duper excited for Rebecca, tomorrow she is going on the DMZ tour! Again, do these days really have to come to an end so quickly? !